We know, we know, Comic Con has been over for a week and a half, but the holidays only ended on Saturday, and then we had some sort of stomach virus, so…. As we do every year, Jewdar made our pilgrimage to the Javits Center for Comic Con, and as we do every year, we enjoyed ourselves immensely. We have to say it was better organized this year than ever before–putting the used comic vendors in a separate room from the new sword sellers was a work of genius; finally, we don’t have to worry that while we’re searching through a bin of 50% off trade paperbacks for Hulk #6 (FINALLY we get to learn who is Red Hulk), Jewdar Junior Junior is skewering Jewdar Junior with a katana. But of course, Comic Con is about more than cheap comics and Gurkha knives. It’s about American culture, and of course, one of those parts of American culture that Yours Jewly played a big part in creating. 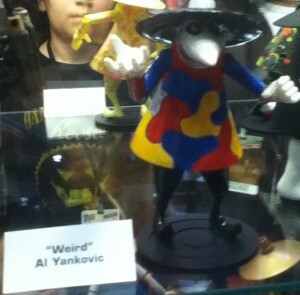 And where else but at Comic Con could you find a work of art like a Spy vs. Spy statuette designed by Weird Al Yankovic?